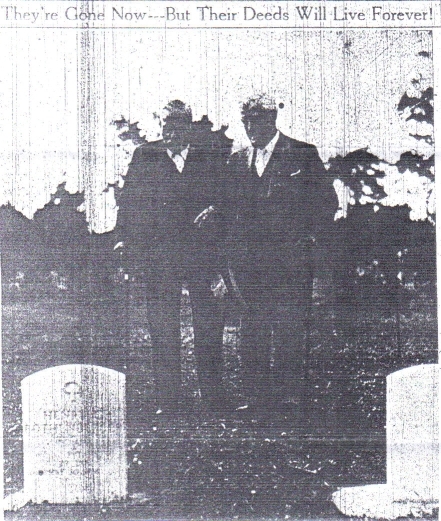 They stood in Beech Grove Cemetery in May 1938. Two tired old men, eyes dimmed, their steps uncertain. They were the last of the “Boys In Blue” and they were on their pre-Memorial Day pilgrimage to their burial plot in Beech Grove Cemetery, where hundreds of their comrades had slept these many years. George H. Robinson, left, and Edward McClelland - they were all that were left of Delaware county's hundreds of men who fought in the Civil War. It was only a few months later, that Comrade McClelland died, leaving Robinson as the sole local survivor of the war between the North and the South. Sunday, George Robinson passed away and today, his body was buried in peaceful Beech Grove Cemetery. The service were held at 2 p.m. at the Piepho Chapel. Spanish-American War veterans served as pallbearers. The Reverend R. E. Boyle, pastor of Avondale Methodist delivered the funeral sermon, and patriotic ritualistic rites were conducted by the Sons of Union Veterans, Eli Thornburg Camp No. 20, and Colonel Samuel Orr Circle, Ladies of the Grand Army of the Republic. Then the cortege moved to the cemetery. There the Sons of Union Veterans conducted the ritualistic service and an American Legion firing squad fired the final salute to the last of Delaware County’s Civil War veterans. A bugler sounded “Taps” and George Robinson’s body was lowered into a grave. Mayor Ira J. Wilson directed City Hall offices be closed during the funeral as a tribute to Comrade Robinson. With the death of Mr. Robinson, Williams Post No. 78, Grand Army of the Republic ceases to exist and its charter, now in the custody of the Women’s Relief Corps, will be returned to the Indiana Department. Thus ends the saga of Delaware County’s Union veterans – men who fought for the preservation of the Republic, just as thousands of Muncie and Delaware County men again are doing today. Incidentally, the above picture was taken by Walter E. Owens, now a staff sergeant in the army air corps. George H. Robinson, 96, Joined Union Army At 15. George H. Robinson, 96, last Civil War vet in Delaware County, died at 4 o’clock Sunday morning at the home of his daughter, Mrs. James L. Zehner, 1503 West Sixth street. Mr. Robinson had been confined to his home the past three years, but his illness became serious only six weeks ago. He was a member of the Avondale Methodist Church. 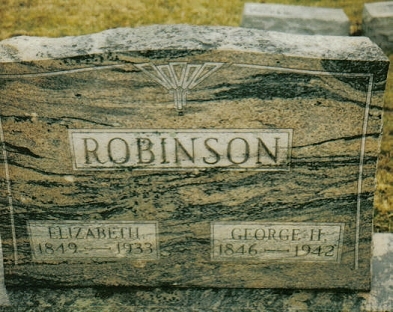 Comrade Robinson was born May 26, 1846, at Concord, N. H. He enlisted with the Union Army light artillery at Wheeling, W. Va., running off at the age of 15 to do so. He was captured and endured the hardships of Libby prison for three months. Freed in an exchange of prisoners, he again joined the Union forces for the duration of the war. The veteran saw Lincoln in a depot in Washington and was in Washington the night the Civil War President was assassinated. Comrade Robinson’s father and three brothers also fought in the Civil War. He is survived by two sons, Thomas R. of Lancaster, O., William H. of Findley, O., tow daughters, Mrs. Zehner, and Mrs. James Harris, both of Muncie, five grandchildren, five great-grandchildren, and two great-great grandchildren. The body was removed to the Piepho funeral home where services will be conducted at 2 o’clock Tuesday afternoon. The Rev. R. E. Boyle will be in charge. Burial will be in the Beech Grove Cemetery. The American Legion firing squad will officiate at the cemetery.